The MadVapes LED volt indicator is one of the staples of my e-cigarette accessory box. I’ve had one of these devices for ages, but haven’t yet bothered to mention them. I figured now might be a good time for that. Why not write a short review of the MadVapes screw-on e-cigarette volt indicator. The volt meter is a fairly specialized piece of equipment. There’s a few scenarios where this device may come in handy. The LED volt indicator is a pretty simple affair. The whole thing is encased in a small plastic box with a clear window. Inside the box is the volt meter electronics. On one end is a male 510 connector with the complementary female connector on the other end. This design means that the device can be operated inline with a cartomizer attached to your e-cigarette. If a cartomizer is attached, the readout will be able to show the voltage output “under load.” That is it will show you what voltage is being achieved with the added load of the cartomizer. The meter can also work without an attached atomizer. In this configuration it will simply show the battery output without any sort of load attached. It’s also important to note that the circuitry in this indicator is fairly simple. As a result, the MadVapes volt indicator can’t read e-cigarettes that use a pulsing regulator to control voltage output. This type of regulator is commonly found in eGo devices. 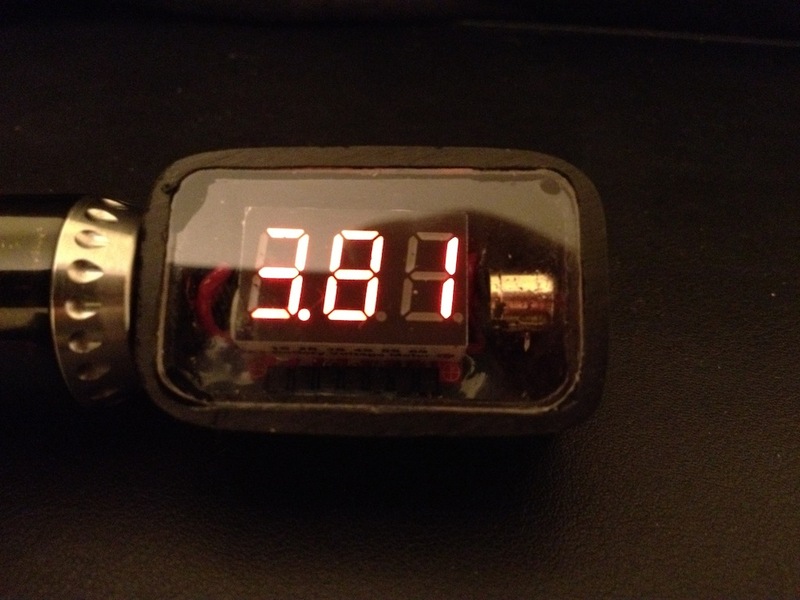 There is also no connected airway, so automatic batteries also will not work with this e-cigarette volt meter. There’s really not much to using the volt indicator. Simply bolt it on, attach your carto or atomizer if desired, then activate your e-cigarette. 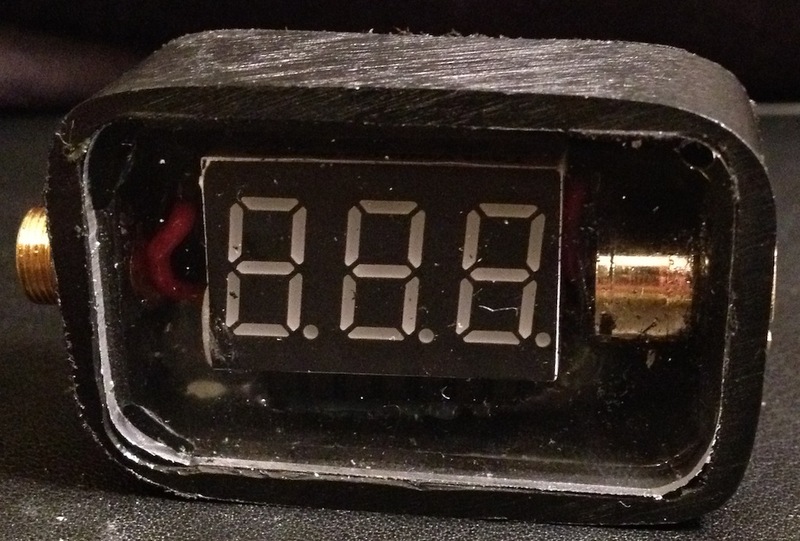 The display on the volt meter will show spinning lights for 1-2 seconds and then display the current voltage. Interestingly, if the voltage changes while in use the display will change without any sort of delay. This is particularly handy for variable voltage e-cigarettes. You can tinker with the voltage dial while activated to quickly dial in the right voltage. If the volt indicator dimly flickers rather than displays the voltage, it means that your e-cigarette has a pulsing regulator and won’t work with the meter. I did not notice any drop in performance while using the device. Which means there’s no real reason, beyond it being kind of clunky, to remove the device while vaping if you so choose. I have to admit, I was much happier when MadVapes just started building this meter directly into their venerable variable voltage box mod. 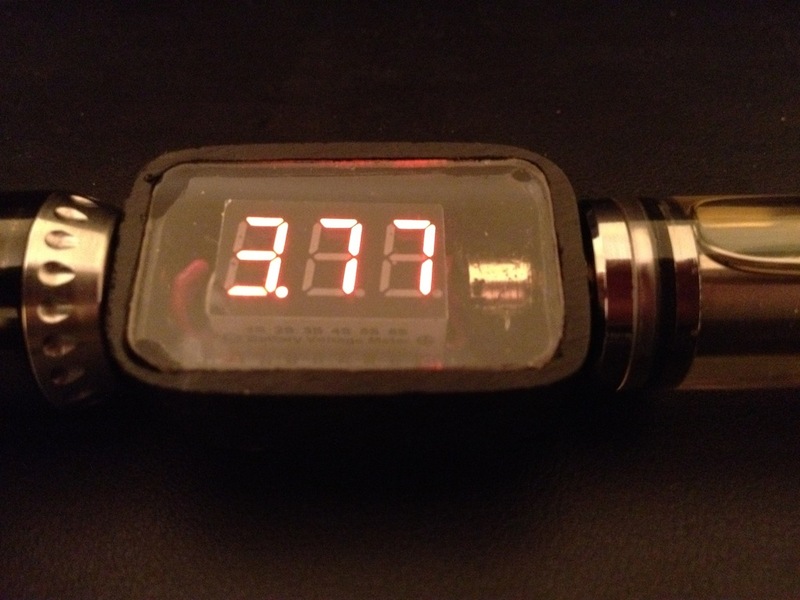 The MadVapes inline e-cigarette volt indicator isn’t exactly a device that everyone will need. However, if you are in one of those situations where you demand to know your voltage, the volt meter is a reliable and inexpensive solution. The volt meters are available in black or white and can be purchased at MadVapes. 777 eCigs e-Hookah Review – It’s an actual hookah! PREVIOUS POST Previous post: February e-Juice Giveaway!